The Mount Michael Community recently gathered to celebrate the many accomplishments of our students over this past school year. The evening started with a special presentation of a full ride ROTC scholarship to Creighton University. 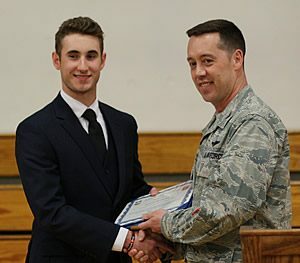 The award was presented to Keyton Pappas by a colonel representing the Air Force ROTC. Keyton will use the scholarship while he pursues a pre-dentistry program. Keyton is the son of James and Lisa Pappas of Omaha. Keyton attened St. Wenceslaus School before coming to Mount Michael. The official awards program began with the athletic awards presented by Activities Director Mr. Derrik Spooner. This year’s Athlete of the Year was Lorcan Jamal. Lorcan was also recognized as a 12 season athlete. Lorcan played sports every season during his years at the Mount. He played tennis, basketball, and golf. Lorcan is the son of Malia Jamal of Omaha and Michael Jamal of Simi Valley, California. Lorcan attended St. Vincent de Paul School before coming to Mount Michael. Ms Gina Fosco presented the Key Staffer Award to Joey Recker. This award is sponsored by the Omaha World Herald newspaper in recognition of each metro areas schools’ outstanding journalism student. Joey was the Editor-in Chief for “The Mount”. Mr. Paul Hotovy acknowledged two sophomores as recipients of two special awards. 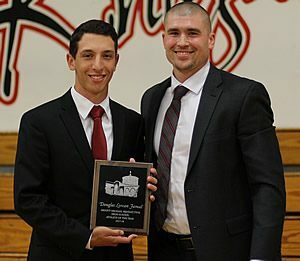 Ben deMayo is year’s Mount Michael recipient of the Hugh O’Brien Youth Leadership Award. Ben is the son of Miles and Lynn deMayo of Omaha. Ben attended Christ the King School before attending Mount Michael. Evan Schroeder was Mount Michael’s recipient the Omaha Exchange Club’s Sophomore of the Year Award. Evan is the son of Andrew and Maree Schroeder of Omaha. Evan attended St. Vincent de Paul School before entering Mount Michael. Ms. Noelle Hinrickson announced that junior Levi Kicken was selected as Mount Michael’s Boy’s State representative. Boy’s State is Sponsored by the American Legion. It is open to current junior students who are in scholastically good standing, model good citizenship and leadership qualities, are in good health, and are willing to spend eight continuous days at the program during the first week of June. Levi is the son of Louis and Amy Kicken of Gering, Nebraska. Levi attend Gering Junior High School before coming to Mount Michael. Educational Excellence: Sebastian Alegrett Morreo, Ben Arkfeld, Ben Bies, Jack Blaser, Ming Hint Chui, Garrett Gloeb, Nolan Huetter, Lorcan Jamal, Hanool Kim, Ian Kim, Riley Kruse, Colin Lakeman, Ziyou Li, Armel Mignondje, Jordan Nguyen, Adam Orr, Nick Orr, Joey Recker, Lucas Rief, Nick Snyder, Mingkai Sun, Matthew Thiele, Dash Wedergren, Lukas Williams. The evening concluded with Dr. David Peters, Head of School, presenting the coveted Mount Michael Award which is given to the senior who best epitomizes the values and character of a Mount Michael Knight. 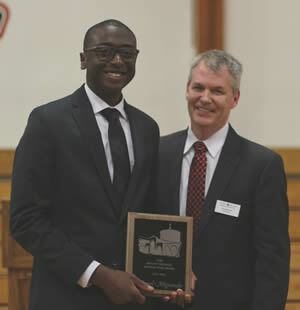 This year’s recipient of the Mount Michael Award is Armel Mignondje. He is the son of Afi Adokpe of LaVista. Armel attend St. Columbkille School before attending Mount Michael. Congratulations to these and all the other Knights recognized for their accomplishments this past school year. Go Knights!